"Twenty years of this? How have I survived this long?" HAPPY EASTER AND BLESSED PASSOVER TO ALL VISITORS! Steve posted in his Facebook Mary Stuart Masterson Group that Mary Stuart Masterson has an audio book coming out this month. There is a link to it below at Amazon. Steve sent me this email,which I picked up just yesterday. Some company is using MSM's image for advertising. It is unknown if she actually endorsed it. The email is below. Not sure if she really endorsed this. Kind of funny after almost 10 years it came out. Hope your foot is better. I'm in Wisconsin again for the week. Grandkids are wearing me out. Warmer weather may be wished for but will probably be too warm! MSM's Love Lives On, rarely telecast since it was first shown in 1985, is now available in either DVD or download. I haven't seen this one in a long time, but remember it fairly well. It is a fine bittersweet story with solid portrayals by all the actors, especially Ms. Masterson who played the main character. Check this out by clicking the link below. The project follows Aaron (Nicholas Pinnock), a prisoner who becomes a lawyer, litigating cases for other inmates while fighting to overturn his own life sentence for a crime he didn’t commit. His quest for freedom is driven by his desperate desire to get back to the family he loves and reclaim the life that was stolen from him. Masterson will play Anya, the Brooklyn District Attorney. She is described as hard-charging, intelligent, politically savvy but take-no-prisoners. She is married to Kate (Indira Varma), the warden of the prison where Aaron is incarcerated. They share two kids. 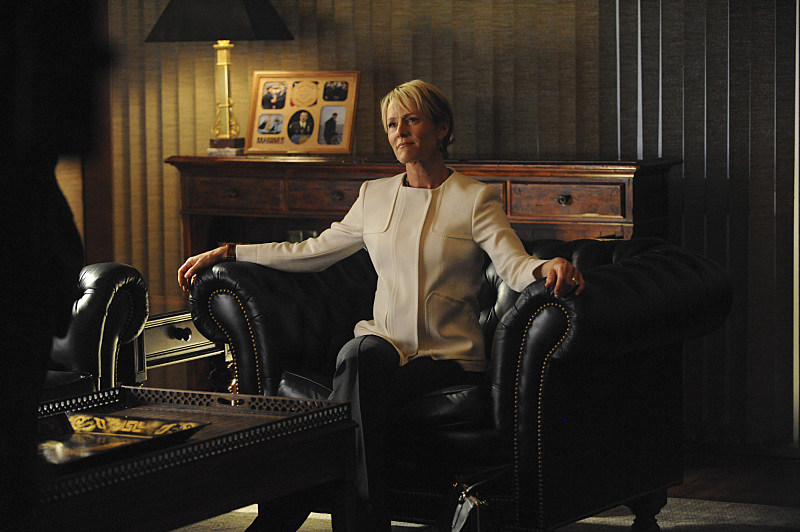 Anya is running for re-election and Kate’s support of Aaron will make that very complicated for her. Claudia found MSM's Twitter account. Ms. Masterson hasn't Tweeted or followed anyone, but Claudia was one of MSM's followers. I did not become one of MSM's followers. I followed Claudia instead, who has some nice Swiss scenery decorating her Twitter account. Below is link to MSM's Twitter. There are some other Twitter accounts about MSM, including a huge collection of photos I think Steve Stark found a few years ago. I always like hearing from Claudia and Steve as they are the best MSM newshounds around. More than once they have sent emails on the same day about the same development in the career life of Ms. Masterson. Claudia's arrived first and described the reappearance of last season's "Big Bad" on Blindspot, FBI Director Hirst. Thank you, all is fine here in Switzerland. Mary Stuart was back on "Blindspot" in Friday's episode (season 4 / episode 14). She was seen in flashbacks and also currently in prison. So Hirst is still there. Steve's report also described how some of MSM's scenes were flashbacks to last season, but also some new ones in the time frame of this season's action. Director Hirst is still alive, and still "in stir," as Jim Rockford, James Garner's private detective from the 1970s used to describe being in prison. Watch the latest episodes of Blindspot or get episode details on NBC.com. It was a flashback episode and may have been just cuts from last year's shows. I haven't watched it thru yet. She still got screen credits! Poster and information about "Daniel Isn't Real". Steve is posting a lot at his Facebook Group for MSM, and this was one of the best because the link takes you to the Ghost Stories stage performance by MSM and friends like Paul Rudd and Jeffrey Dean Morgan, both versatile actors. In addition to the money raised by the production, the newspaper reporting about Ghost Stories provides links to how the reader can purchase some of the photos that accompanied the article. I've purchased some from two New York State papers in the past and have a couple of them up in my office now. They are not expensive, so take a look! Check out the most recent copy of Entertainment Weekly, which focuses on some of the most popular Romantic Comedies (Rom-Coms) of the last few decades. Among those covered are When Harry Met Sally, 27 Dresses, Pretty in Pink, Four Weddings and a Funeral, Say Anything, but most of all for MSM fans, Some Kind of Wonderful. 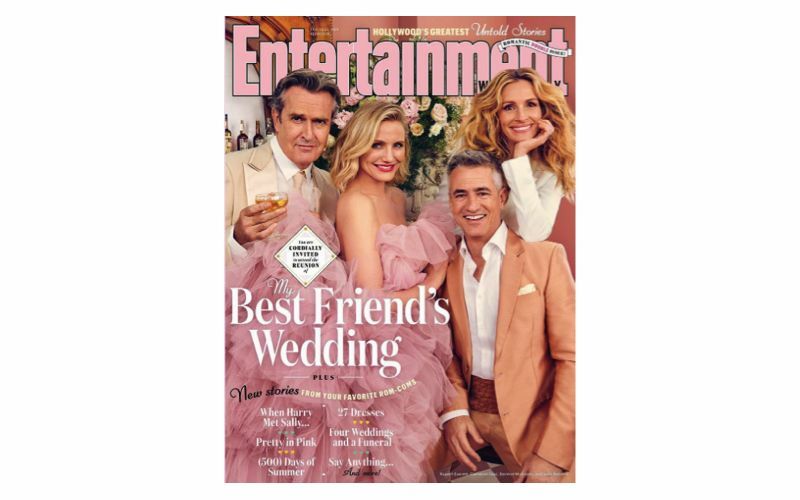 This special issue was built around the cast reunion for Julia Roberts' My Best Friend's Wedding with the cover showing the four main cast members, Julia Roberts, Dermot Mulroney, Cameron Diaz, and Rupert Evert. Everything on the cover seems to be pink, but if that isn't enough, just use the image above for a guide! MSM speaks in this one. Steve passed along the existence on You Tube of one of MSM's audio books as he recently provided one for her Merry-Go-Round an example of old time radio plays by LA Theater Works from back in the late 1990s. I found the embed code and the video is below. 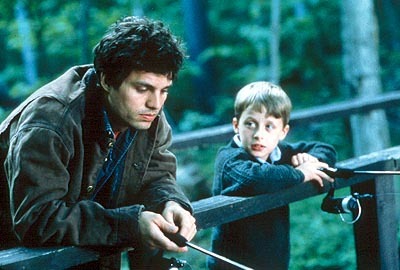 Mark Ruffalo in the 2000 film You Can Count on Me. I picked up the email late last night to find Claudia and Steve both intercepted the news that MSM completed another independent film, and it will be showing at the upcoming Southwest Film Fesitval. First we have this email from Claudia and the link to the article she found. Apparently there is a movie with Mary Stuart that we haven't heard of yet. "Daniel Isn't Real" will be shown at the SXSW Film Festival. Steve's MSM Facebook Group news posting included a brief synopsis of Daniel Isn't Real along with director and screen writing credits. Steve also discovered that MSM's co-star from On the 2nd Day of Christmas, Mark Ruffalo, paid a visit to STOCKADE WORKS to take a look at how Ms. Masterson's enterprise is preparing a whole new generation of filmmakers. The link about Mr. Ruffalo's visit at Stockade Works is below. Steve has embedded a great interview of several original cast members of the Broadway musical Nine on his Facebook group. My advice is to get over there and watch it! Join Steve's group. Facebook doesn't charge, and neither does Steve! STEVE STARK FINDS A YOU TUBECHANNEL WITH MSM'S MERRY-GO-ROUND RECORDED "RADIO PLAY"
Steve is really bringing back memories for me with this find. I've tried to find links to where a copy of some kind, tape, disc, or download could be located for this recording, but came up empty. This You Tube channel is the only location that has a copy of this charmer from the 1990s. It is embedded below, so just fire when ready. Years ago, the Tavern linked to a site called The John Hughes Files, which was mentioned in the post on the FYI Page about the death of John Hughes, the director of MSM's extremely popular movie Some Kind of Wonderful. Christine Giseske created that site in 1996, the earliest year when average Americans began putting up personal Web sites on the Internet. Ms. Giseske was in college at the time, suffered from a bout of the flu, and while absent from classes for a few days, rented and watched several Hughes movies. This inspired her to create the site which became the most prolific provider of the history of John Hughes as a filmmaker, along with the most recent developments in his career. It became a huge database of news and trivia about John Hughes and his films. Some Kind of Wonderful was frequently mentioned on the many pages, along with the performers, including Ms. Masterson. I recently became curious about the status of The John Hughes Files, and clicked on the link, only to discover the link was dead. Some years before, about 2011, Christine had informed her visitors to The John Hughes Files that the site would no longer be updated regularly. A visitor, Scott Collins, had volunteered to continue to upload recent articles, but updates would be very irregular from that point on as her life priorities had necessarily changed. Now, the site was gone. When I tried her River Blue site, for which The John Hughes Files was a satellite site, I discovered that Christine Giseske had passed away. Her site is no longer active, but is still available on The Wayback Machine. I took some screen captures from The Wayback Machine to show new visitors to the Tavern how the site looked. I wish I had discovered this in past years, but Christine's work was so good I thought she deserved a mention here no matter how late. We all start taking these places like The John Hughes Files for granted and lose touch with them thinking they will always be available. That just isn't the case. Nothing is forever on the Internet. Enjoy it while you can and appreciate the efforts of those behind the sites you enjoy. In the meantime, Christine's obituary is available by clicking the link below. Once that link opens, click on the second link, "Rest in Peace, Christine," and it will open her obituary. This post will be the first of several sites to be remembered in the Tavern's Museum pages. Screen Capture of the Front Page concerning John Hughes' death. Bottom of Front Page showing awards won by The John Hughes Files including an Entertainment Weekly Pick-of-the-Week and a Yahoo! pick. Yahoo's review of the site is below. Christine celebrated ten years online in 2007. I wonder what Marleen Handley of Saginaw, Michigan won in the John Hughes Contest. That's a shoutout, Marleen! The Broadway World Web magazine includes some information about the opening of a musical stage production of MSM's Benny & Joon. Ms. Masterson isn't starring, but the story is about a new version of one of her most popular films. The link below will take you to a good article on Record On Line with a nice photograph included. Steve has new stuff all the time on his MSM Facebook Group. Be sure to check it out! Facebook is free, after all. STEVE STARK FINDS A RADIO INTERVIEW BETWEEN TWO CHEFS WHO MENTION MS. MASTERSON. CLAUDIA KEHL ANNOUNCES THE LINKS TO MS. MASTERSON'S LATEST FILMS ON IMDB. Steve Stark, still running the active Mary Stuart Masterson Group on Facebook, found a link to a radio show's podcast, Duffified Live Chef in which Chef Michele Regussis is interviewed. Chef Regussis explains how she came to meet Mary Stuart Masterson, and start collaborating with her in filming about cooking, shortly after moving to New York's Hudson Valley. I think a minority of the people there do not know Ms. Masterson at some level as active as she is in her family, working, and civic lives there. It is an enjoyable show. I found so many of these because of this site, I wish I had more hours in a day to keep up with them. There are just too many. The link to the Duffified Live show is below. Our alert Claudia Kehl, surfing the Web in the shadow of the Swiss Alps, found that Mary Stuart Masterson's latest three films now have links on IMDB. Those links are now active on the Body of Work page of the site, with the link below. Regular updates have resumed with the new cable television schedule. The Tavern wishes all visitors a very happy, prosperous, and healthy New Year of 2019, which will be the 21st year of existence for this site, with 17 of those in regular updates. I don't know where all the time went. It is with great sympathy that I extend to Ms. Mary Stuart Masterson and her entire family my condolences, along with our correspondents, Claudia Kehl and Steve Stark, and I am sure those of all visitors to this Web site from around the world, upon hearing of the death of her father, Peter Masterson. Mr. Masterson achieved a long and successful career in acting, writing, and directing both films and plays. 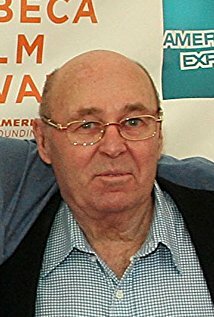 He has directed his daughter, Mary Stuart Masterson, in such films as Whiskey School and the Showtime Television movie Lily Dale, which was orignally written by Peter Masterson's cousin, Horton Foote. Mr. Masterson also shared the screen with Mary Stuart in the films Gardens of Stone and The Stepford Wives. It was 28 years ago today that I lost my own father from cancer on Friday, December 21, 1990, a year that has the same calendar for December as 2018, so the death of Ms. Masterson's father brought back the memory of my family's loss. In an expression of sympathy, I am reposting below an entry from May 27, 2000 on the FYI Page archives about a trailer for the Showtime Television movie Mermaid, directed by Mr. Masterson, when Showtime visited the set. Also, we are repeating an article about Horton Foote's works that included Lily Dale. Finally, there is a scene from the film No Country for Old Men that has helped me to hope that maybe I will see my father again, waiting for me to arrive where he has been waiting for me. Visitors to the Tavern that wish to leave condolence messages may do so by clicking the link below to the Guestbook Gateway page where the link will take you to the new guestbook. Thank you. Ellen Burstyn and Main Female Cast Members of "Mermaid"
Pete Masterson, father of Mary Stuart Masterson, directed "Mermaid," a Showtime Network movie shot in the Vancouver area in Canada. It is the story of a kindergarten-aged girl, Desiree, or "Desi," as her mother and grandparents call her, who loses her father to an accident. Desi and her mother move in with her mother's parents (the grandmother is played by Ellen Burstyn) and try to start over. The big worry on everyone's mind is Desi, who is now referring to herself in the third person and refuses to attend day school. When mother and grandmother take Desi to the cemetery, and explain that her father is now in heaven, Desi wants to send him a letter. A kindly man who is always in thebackground, and always working different jobs (mailman, cemetery attendant, Good Humor man, etc.) seems to always be watching out for Desi and her family, but his true nature is a mystery. Desi's mother takes Desi out flagging for the biplanes dropping seed on nearby farm fields, which is the business of the grandfather. One of the pilots takes an interest in Desi's mother, but she is still in mouring for her husband. At a county fair, Desi is given a balloon by a vendor (that man with all the jobs). The balloon has a mermaid on it, and Desi's favorite doll is the mermaid her father gave her. She launches the balloon with a letter to her father hanging from it. The balloon drifts from California to Prince Edward Island, where a duck hunter finds it and takes it home. Reading the letter aloud to his wife and two daughters at the dinner table that night, the family is at first undecided about whether to write to Desi. Something happens that night to inspire the mother to write to Desi, and send her a Mermaid book as a birthday gift. The mother writes that she is certain Desi's father made sure they got the balloon so someone could help him celebrate Desi's birthday. The Prince Edward Island town where the balloon was recovered was named Mermaid. This is a fine family film, rated TV-G, suitable for all ages. The performances are fine, and Mr. Masterson's work with the camera was up to his usual high standards. The movie was based on a true story, and the real Desi, her family, and the Prince Edward Island family are shown visiting the location during the closing credits. Desi even yells "Action!" and "Cut!" for Pete Masterson as she sits beside him as he directs a scene. Mr. Masterson remarked, chuckling, "She did that pretty good." I was spending this work week at the Red Roof Inn in Cranberry Township, just north of Pittsburgh, one of the few motel chains that offer Showtime network rather than HBO. This evening Showtime presented Horton Foote's "The Convicts," the story of a thirteen-year-old boy in 1902 Mississippi, on a sugar cane plantation. The plantation is worked by convicts from a nearby prison, under the watchful eye of the elderly Confederate veteran who owns the plantation, portrayed by Robert Duvall. The boy, named Horace, played by Lukas Haas, lives with an African-American couple who work on the plantation, James Earl Jones being head of that house. Horace runs the plantation's small store. Some relatives are visiting the plantation owner, one of whom is played by Carlin Glynn, Mary Stuart Masterson's mother. Peter Masterson, Ms. Masterson's father, directed "The Convicts." At one point, Horace tells Duvall's character that he has no brother, only a sister. His sister and mother live in Houston now that his father is dead. Horton Foote would continue Horace's story into the post World War I era when Horace would travel to Houston to visit his mother and sister. 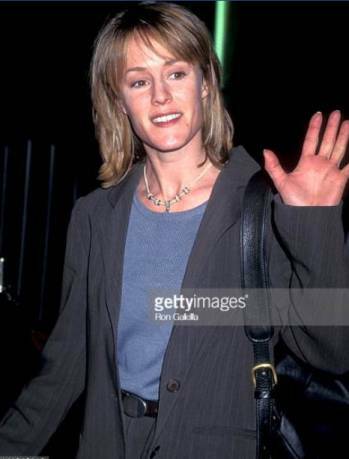 His sister's name: LILY DALE, a character Mary Stuart Masterson would portray on both the stage and for Showtime in 1996. MERRY CHRISTMAS TO ALL TAVERN VISITORS! 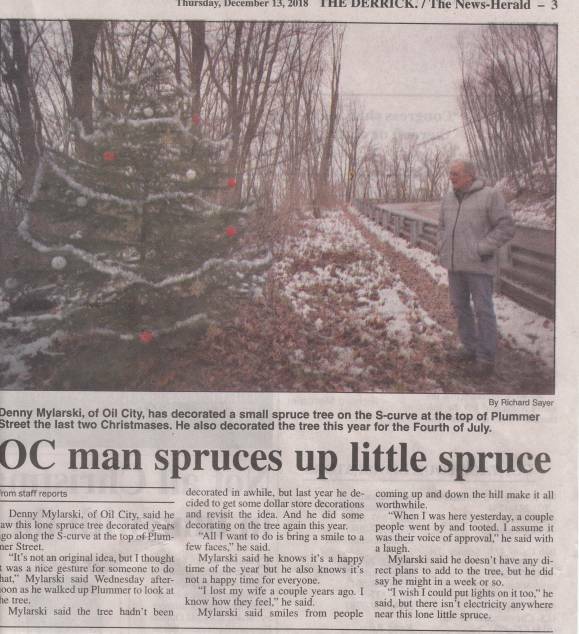 In 2016 I took a photo of the tree in the article above, calling it "The Charlie Brown Christmas Tree." Well, we know who decorated it the years after that, 2017 and this year. The tree grew a bit, but is still pretty small as the surrounding trees keep the little guy in shade a great deal of the time. It may be growing slowly, but it still looks good. MSM at International Emmy Awards. I no sooner got back from Thanksgiving to find my email box had reports from both Steve and Claudia. Steve posted this on his Facebook Group's timeline about MSM producing, co-writing, and co-directing an independent film in the Hudson Valley under the auspices of her production facility, Stockade Works for her new company, Quality Pictures. Check our website for more info and to read the blog of one of our producers Cassandra Del Visco! How are you? I am quite good. Mary Stuart was a presenter at the International Emmys in New York on 19th November. So cool to see her on such an event again. This last link is a bit tricky. A search result link, it was a bit long to type in, so the link below will take you to Picture Desk. After the page opens, use the search engine in the upper left corner according to the screen capture below the link, and type Mary Stuart Masteron into the search engine bar and a lot of her photos will appear. THANKS TO CLAUDIA AND STEVE FOR ALL THE INFORMATION ABOUT MS. MASTERSON'S NEW FILM, HER APPEARANCE AT THE INTERNATIONAL EMMYS, AND THE PHOTOS! 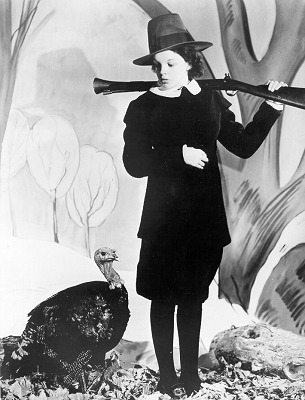 HAPPY THANKSGIVING TO ALL VISITORS! Claudia sent me an email a few days ago about a Storyhorse Theater production soon to play at Hudson Hall. The stage production is called Face It, and will consist of three short plays in one production. Check it out by clicking on the link below. I told Claudia the news would be up on the site sometime after my return from Greensburg, Pennsylvania over the weekend where I enjoyed a concert by Petula Clark at the Palace Theater on Otterman Street. My cousin, Nancy Collette, and my sister, Linda Jordan-Platt watched the concert from Box 2 right over the stage. It was a long drive back Sunday, and I needed most of today to decompress, but what a great show it was. At age 85, Petula Clark can still sing with the best of them. MSM on the set of Chef Michele in New York. The first email from Claudia is about a new venture for Ms. Masterson, the start-up of Quality Pictures, a film production company emphasizing creating opportunities for women and those of minority groups, including the LGBTQ community, to express themselves both in front of, and behind, the camera. MSM is partnered in this new project with Alexandra Brodsky. The films will be shot in the Hudson Valley are of New York State. 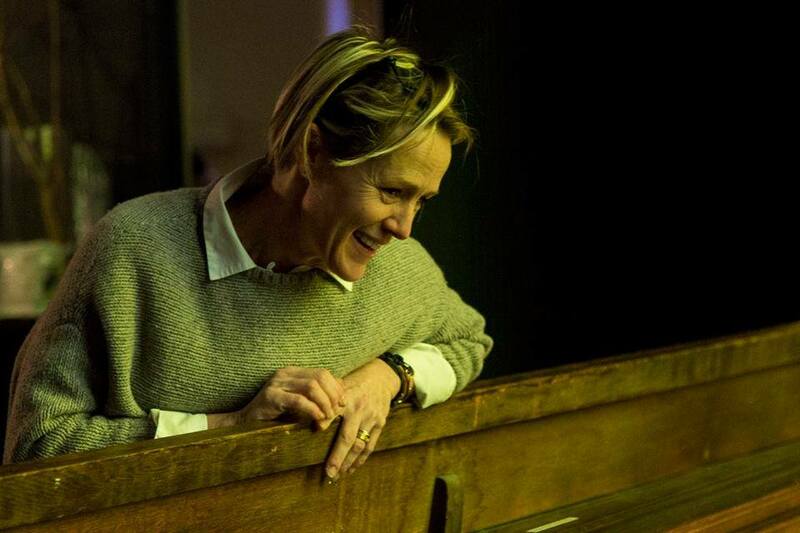 Mary Stuart Masterson will star in a Quality Pictures production entitled Tilly and Dorry, which should be ready for release sometime in early 2019. So we have another entrepreneurial effort along with starring in a new independent film. Ms. Masterson continues to expand her reach in film through multiple vectors as actress, producer, director, and businesswoman. Mary Stuart has posted this link on her instagram. She has founded this company with Alexandra Brodsky. There is also some interesting info. She is currently developing American Bollywood, about her experiences as a Bollywood screenwriter as well as the upcoming feature, Tillie and Dorry starring Mary Stuart Masterson. Claudia also informed us about another business effort of Ms. Masterson, the upcoming Upriver Studios. This company does not have a Web site as yet, so Claudia couldn't supply a link to it. I Googled it, and found that there are several other businesses that have the same name. Upriver is not planned to start business until 2019. In the third email, Claudia described MSM's stint on a television program hosted by Chef Michele Ragussis. I visited the Chef's Web site, finding that his motto is: Discovering Hudson Valley, one dish at a time. The photo at the top is from the show, and there are photos on the page Claudia linked in her email. Additional links to each are also at the end of this post. Here she was directing something for a chef called Michele Ragussis. At least something with cooking. You can find a couple of pictures of Mary Stuart on the set. Joey Bragg, title character in a new movie also starring Mary Stuart Masterson. 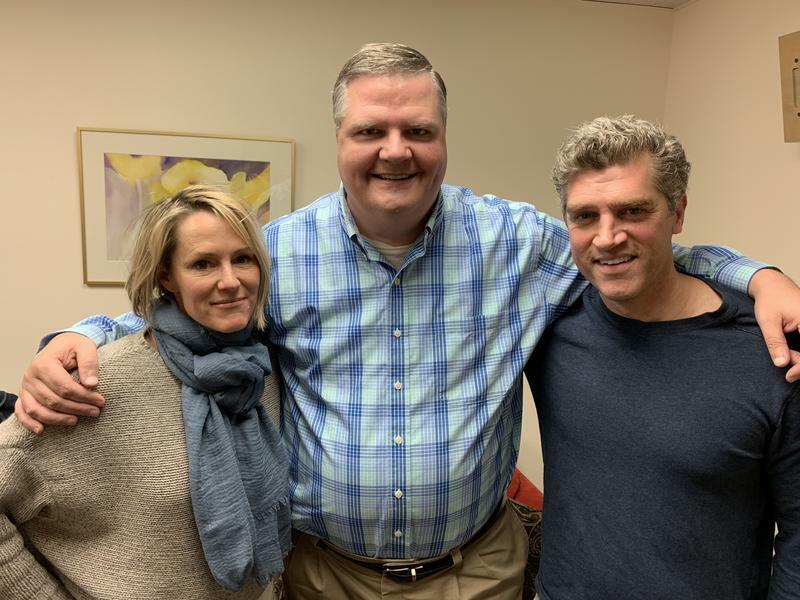 Steve Stark passed three announcements to me, including an email about Mary Stuart Masterson's new movie, Sid is Dead, currently being filmed in the Syracuse, New York area. The movie stars two former Disney Channel favorites, Joey Bragg of Liv and Maddie and Genevieve Hannelius of Dog with a Blog. Steve's link includes the following description of what happens to Joey Bragg's Sid. Deadline reports the movie will follow "a socially invisible high school senior" named Sid (Bragg) who gets the school's biggest bully suspended and faces certain doom when he returns. As a result, Sid tries to live it up for his last two weeks alive with help from his best friend Jim; Eric, the captain of the hockey team; and Sid's crush Tiff (Hannelius), the bully's girlfriend. Steve also reported about another project of Ms. Masterson, The Face of It, a local Hudson Valley project co-created by Ms. Masterson. The Face of It is comprised of live readings of one act documentary plays, and includes such subjects as "the vagaries of aging," I've been experiencing plenty of those, hunting Sasquatch, and the more devastating choices individuals can make. 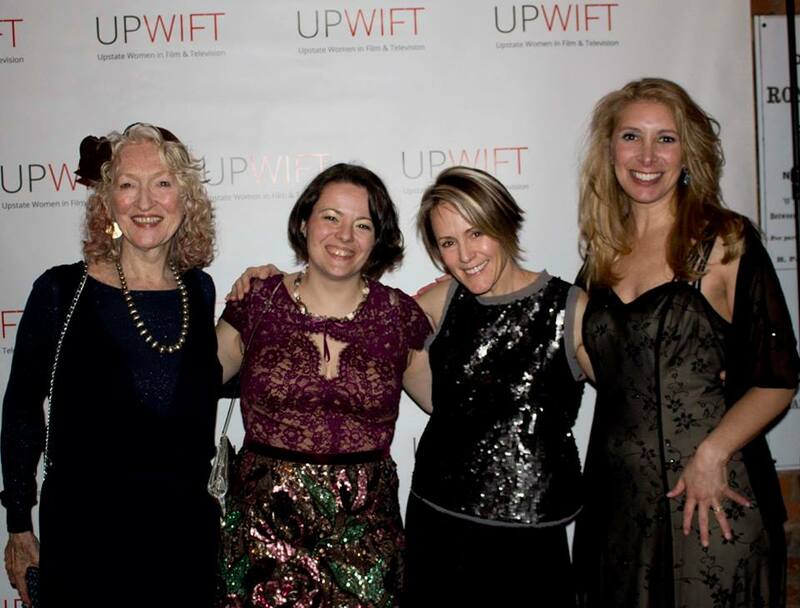 The Face of It will be shown at Henry Hudson Hall on November 10th and 11th. For tickets call-- (518) 822-1438. Steve found the video embedded below of a huge campaign extravaganza put on for the mid-term elections which includes such notables as Ms. Masterson and actor Paul Rudd. The video can be seen below and is on You Tube. Well, we have started yet another holiday season at Mary Stu's Tavern, and the way time is flying, we will be getting ready to greet 2019 in no time at all. I wish it would slow down, but it is not likely to do that. 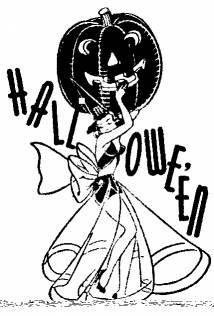 I put the black cat with the jack-o-lantern on the Cable TV Schedule page, as usual, along with the traditional autumn photo of what looks like Bavaria in the Alpine foothills. Doing some of the same things we did in 1998 makes everything look familiar, like the not-so-scary witch we put up again this year. We have the statistics of the visitors to the site complied on the "Hall of Flags" pages. While the traffic is slower, we still get a fine mix of visitors from all over the planet, which is what makes the Internet so special. China actually leads in visitors this year, with the U.S. second, and Japan third. We hope all the visitors enjoy the site and keep coming back to see the new and the familiar sights in this place. I plain forgot to post this update yesterday afternoon, but here it is today. 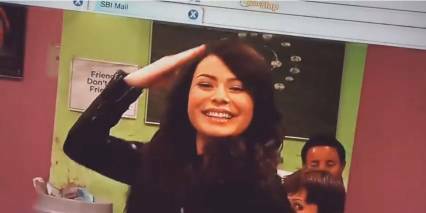 The film Sarah, which was announced at about the same time as Skin, which was reported earlier on this page, will be released sometime early in 2019 as reported on Yahoo News. Both Steve and Claudia caught this one at reported through email and Steve's Facebook group on the same day. Below is a excerpt from the article and a link to the next. Craig Sheffer has joined the cast of “Sarah,” a supernatural coming of age film, which centers on a young girl who is a harboring a dark secret, Variety has learned exclusively. Tallulah Evans portrays the title character. The film also stars Mary Stuart Masterson, Ava Allan, Valeria Cotto, Claudia Lee, Spencer List, Daniel Pinder, Andy Schrock, D.B. Sweeney and Virginia Madsen. Sheffer, whose credits include “One Tree Hill” and “A River Runs Through It,” will be playing the sheriff with the belief the the title character is a practitioner of witchcraft and responsible for several unexplained deaths. He will also be the love interest of Masterson’s character. “Sarah” is being directed by Alexander Garcia who wrote the screenplay and is also producing the film under his Multi-Valence Productions banner alongside producing partner Anne Stimac, Stuart Arbury and Michael Abrams. Producers plan to release the film during the 2019 Halloween season through Vision Films. Sheffer is repped by Kramer Talent Agency. Steve recently found a new video of Ms. Masterson giving a talk about "Future Funding of the Arts." 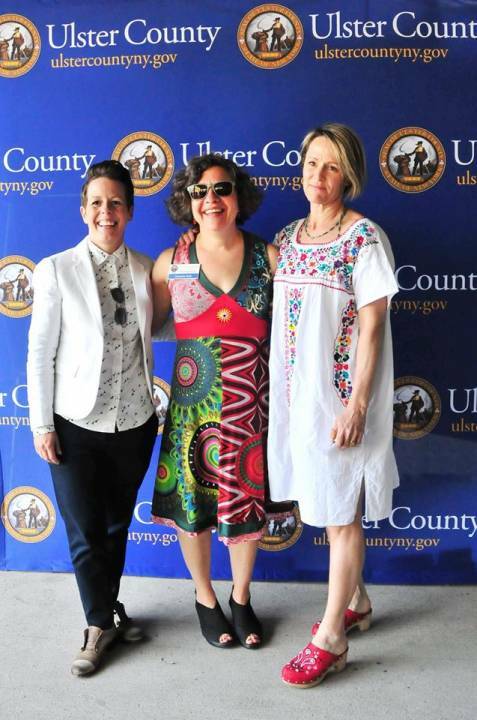 In light of Ms. Masterson's successful launch of Stockade Works in the upper Hudson Valley in New York, other regions are interested in finding out from her how filmmaking, and other opportunities for artists and musicians, can thrive in towns and cities needing economic activity. To listen in, just fire up the embedded video below. There were a few new items posted by Steve and other members this week. The most interesting to me was the article and photo of Ms. Masterson from Entertainment Weekly from sometime in 2002 or 2003, shown above. It was from an article titled Mary Stuart Masterson's Five Year Plan and highlighted her upcoming role in the Broadway musical Nine. MSM discussed with the reporter about how she liked to sing in the shower, and the photo showed her wrapped in a towel and stepping out of the shower. I posted that I recalled that article, but somehow didn't save a copy. I still can't remember if I sent it to Yun Leong along in Australia along with another magazine. Anyway, the copy of the article was on sale on EBAY. There is no other copy of either the magazine or the article alone anywhere on the Internet. Steve's post about the article about Nine caused me to look up the FYI page in the Archives that covered nothing but Nine in 2003, including Claudia Kehl's Easter visit to the United States to see the musical, and then meet MSM at the stage door for photos that were posted to this Web site. That was a good time. Steve is now the owner of a copy of Mad at the Moon. I bought a VHS tape of that film in 1996 and still own it. Remember to stop in and visit Steve's Facebook group and sign up for Facebook so you can visit with the other members of the group. 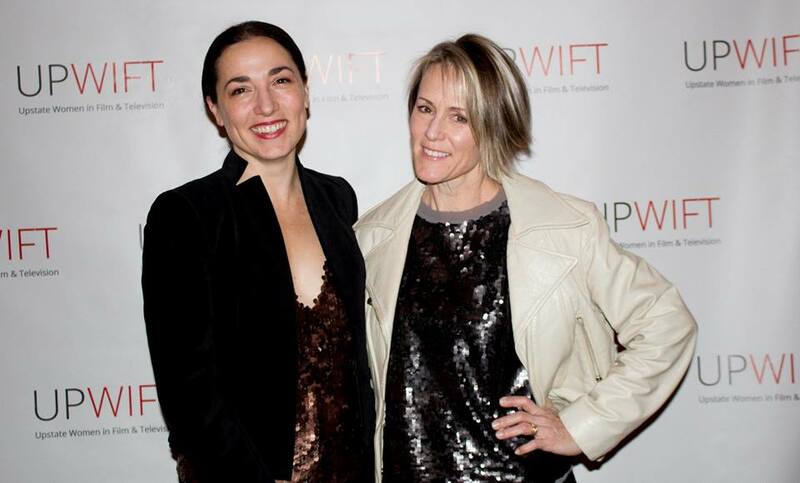 News about the upcomng independent films starring Mary Stuart Masterson, Skin and Sarah. A photo is posted on the group that is available for purchase on EBAY. It is a fine, autographed photo of MSM during filming of Some Kind of Wonderful. Drumsticks are visible, sticking out of the bag she carries on a shoulder. MSM is scheduled to appear at the ARTHOUSE FILM FESTIVAL on September 24, 2018. The link is below. These and other news items, discussions, and commentary are free for all to enjoy just by registering on FACEBOOK. Registering is free of charge. The link is below. Claudia sent this very timely email which I received on August 13, 2017, but kept forgetting to check my email until today. The story behind Skin is fascinating as it deals with the real story of Bryon Widner, who was raised a Skinhead, which means he was raised to be a racist in the same bent as the Nazis in the 1920s, 30s and 40s until the defeat of the Nazi Party in Germany with the end of World War II. Bryon turns away from the Skinhead movement, but must have the tatoos representing Skinhead ideology removed from his body in a series of painful surgeries. This could be a fascinating character study. A black activist helps Bryon Widner with his efforts to remove the tatoos. Steve posted two upcoming Storyhorse Theater events, one being in the Hudson Valley area of New York State, and the other being in a familiar stomping ground from my past, the southeastern part of Pennsylvania, namely Ursinus College in Collegeville, Montgomery County, Pennsylvania. The two stage presentations will be shown according to the convenient schedule below, along with the exact locations. THE FACE OF IT--Three One Act Documentary Plays--will be presented on the dates of November 9, 10, and 11, 2018 at the Hudson Hall in Hudson, New York. THE LITTLE THINGS--Mary Stuart Masterson's and Jeremy Davidson's acclaimed documentary play about the challenges of Lyme disease--will be presented October 13, 2018 at the Kaleidoscope Theater on the campus of Ursinus College in Collegeville, Pennsylvania, just off US 422, the Germantown Pike. I lived in Phoenixville, Pennsylvania, home of the Colonial Theater, the one attacked by "The Blob" in the Steve McQueen movie from the 1960s, `for a little over one year starting in 1986, and in Royersford, Pennsylvania from 1987 until 1989. In addition to the Colonial Theater, Phoenixville was the home of the Longabaugh family back in the late Nineteenth Century. Harry Longabaugh was one of the Phoenixville Longabaughs, and known in history as The Sundance Kid. 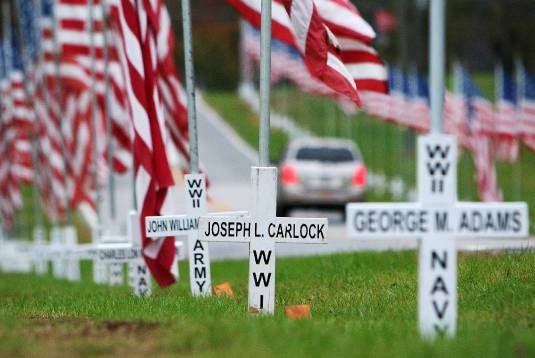 Members of his family are buried in Phoenixville, including his sister who recorded the date when her "brother Harry left to go to the West" in her diary. As reported a long time ago, there was a musical stage play built around the Benny & Joon story and characters, and it is coming back to the Paper Mill Theater as descibed in the Broadway World article linked below. The photo of MSM from Some Kind of Wonderful on Alexander Garcia's Instagram post about the upcoming film Sarah, starring Mary Stuart Masterson. Our intrepid Swiss reporter, Claudia Kehl, sent word in the following two emails that Ms. Masterson is presently working on two film projects that are already entered on her IMDB filmography. One, Skin, is in post-production while Sarah is in pre-production. Good news! I just saw on IMDb that Mary Stuart has two new projects listed. I read on an Instagram post about the "Sarah" project and googled it. So I came to IMDb where it's already listed. She even has two former co-stars in this movie, Virginia Madsen and D.B. Sweeney. It's really great! That was the Instagram post by Alexander Garcia, who is the director and writer of "Sarah". It was great to get and email from Claudia this weekend after the annual antique car picnic at my cousin's house in Portersville, Pennsylvania this past weekend. Claudia is experiencing a summer heatwave under the Alpine skyline of her native Switzerland, but she's so naturally cool that she is holding up extremely well. Claudia's email is below along with the link to the article. I hope everyone in the Northern Hemisphere is having a great summer, and all of you in the Southern Hemisphere enjoy whatever version of winter you're experiencing. We'll be trading off in a matter of weeks now. How are you? Do you also have so hot weather at the moment. Here in Switzerland it's very hot. Luckily I have now three weeks off. I found this picture of Mary Stuart and Jeremy at a gala for "The Richard B. Fisher Center for the Performing Arts". I think they're there every year. At least I remember pictures from previous years. Look at Jeremy's moustache. ;-) Maybe he needs it for a role. HAPPY INDEPENDENCE DAY FOR ALL USA VISITORS! Well, we're almost done with another month already. Some people think summer is just about over with July 4th, and that is almost here. The way I can tell it's summer is when I have to track down where this year's carpenter ants are getting in here. I found it on Sunday, told maintenance on Monday, and on Tuesday there are no more visitors arriving to feast at the ant bait I put out for them, so I can track a couple to their exit. That's how I know what time of year it is. You can note it on the calendar when these little buggers show up--SUMMERTIME! Anyway, I've been using the Comcast Xfinity site for a television schedule after the loss to the Time-Warner site, which was almost as good as Locate TV, except they emailed me when the schedule was ready for me to pick up. Now, I have to build them again. The best part about Xfinity's site is the background picture on each movie's schedule page. You enter the title in the search engine and a link is pulled down. You click the link and the page comes up, complete with the schedule of any telecasts of the movie. There are some fine stills from MSM's movies on each of the pages. The best was from Heaven Help Us, but screen capturing it was not possible. I got two screen caps, one from Married to It, and from Radioland Murders. Enjoy! I don't mind showing these as I pay a king's ransom for cable. Screen capture of the Xfinity still from Radioland Murders. Sorry about the extraneous words on the photo. I'll have to take them off with some software and reload, but not today. It is still worth it. MSM with co-star Robert Sean Leonard (House, MD) in Married to It (1993). WISHING MS. MASTERSON ANOTHER HAPPY BIRTHDAY--THE TAVERN'S ANNUAL SALUTE! 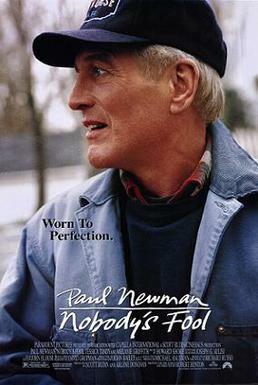 We have some special links and videos for Ms. Masterson this June, starting with something special for someone who works hard to see more films made in the Hudson Valley, here are two links to a blog that includes photographs of the actual locations of the Paul Newman film, Nobody's Fool, my favorite Paul Newman movie of all time. It was shot entirely in the Hudson Valley, in places I am sure Ms. Masterson has visited from time to time. Next up, we have an embedded YouTube video. One thing I learned from YouTube is that a lot of people out there notice some of the same things in movies that I do. For example, I found a YouTube video of the fountain scene from the original 2001 Ocean's 11. I wondered if anyone else thought that was the most memorable scene in the film, and many people did. I used an embed of that video as a tribute to all of my co-workers who retired at about the same time as I did in 2013. This video displays the most unique and creative ending credits for a movie I have ever seen. I doubt a whole lot of people stayed in the theater to see all of those credits roll over these photographs of all the technical people who helped make the four Lethal Weapon movies starring Mel Gibson and Danny Glover, but I think I would have. The idea of showing photos of all those unseen contributors who worked on this four-movie franchise from 1987 until 1998 was genius. The last panoramic shot of all of them with some of the actors, ends it. A birthday celebration is nothing without a little humor, and this year we have something I am sure Ms. Masterson will remember for a long time. In this year of #METOO we have JOHNNY BRAVO getting trashed by every female he encounters. Sometimes you can really feel for the clueless Johnny Bravo. WHOA MOMMA! Claudia reports that she is doing fine over there in Switzerland and sent along a link to the Dutchess County Film Conference, which involves filming in New York's Hudson Valley, something of keen interest to Stockade Works foundress, Mary Stuart Masterson. This is timely for another reason, as shooting film in the Hudson Valley is part of what the Tavern's annual birthday month greeting to Ms. Masterson is all about. So, without further adieu, the embedded video is below. The cover of the novel by Barbara Delinski narrated in the audio book form by Mary Stuart Masterson. 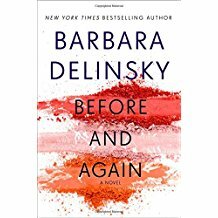 Steve sent me an email about the latest audio book narrated by Ms. Masterson, Before and Again by Barbara Delinsky in addition to his having a good time with his grandchildren in Wisconsin. The novel, by Barbara Delinsky is about MacKenzie Cooper, a woman whose life was ruined by a traffic accident in which her daughter died and she was found criminally responsible. At nearly the end of her probation, MacKenzie moves to Vermont and takes a job as a make-up artist at a spa under an assumed name. When one of her new friends experiences a family tragedy, MacKenzie has to decide whether to risk everything she has scratched out for her new life to support her friend in need. I might want to give this one a listen, or read the print version. The second news from Steve was his finding an old CBS Television trailer for an episode of Ms. Masterson's Kate Brasher series. That trailer is embedded below. Those of you who want to keep in direct contact with Steve, who always has something going on at his Mary Stuart Masterson Facebook group, hit the link below the embedded video. Mother's Day being on a Monday I ran into the Stewart Twins in one of the pews behind mine at Saint Joseph's Church in Oil City. I've known the two girls, Allison and Chris, for about 25 years now. They each have a group of about five boys now. They are the daughters of Mary Stewart, whom I have known a little longer than the girls. I wished them a Happy Mother's Day as I left, approaching Allison last. Pointing out her sons I assured her, "Look, no one has been killed or maimed, and no one shot an eye out this year. See? You are doing a good job!" You are not alone, Ms. Masterson. 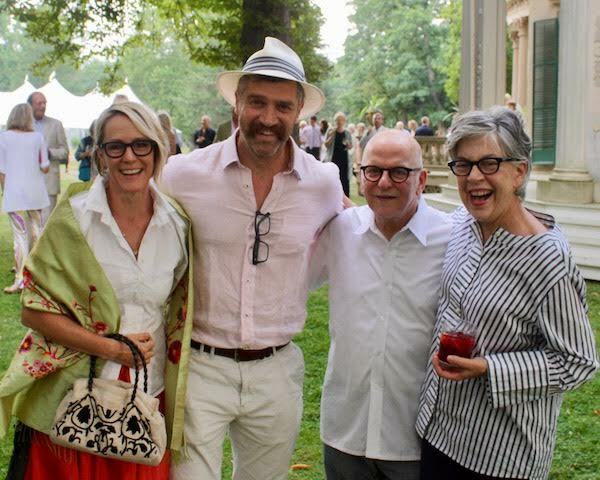 Mary Stuart Masterson at a function focused on the Hudson Maritime Museum. A link to the article is below. Steve is always running down some interesting stories about what Ms. Masterson is up to in Upstate New York. There were two events in the Hudson Valley covered by the local media that Steve posted on his Mary Stuart Masterson Facebook Group. There is an article in the Poughkeepsie Journal about the success that groups supporting filmmaking in the Hudson Valley, such as MSM's Stockade Works, have had in attracting movie projects to the area. One such film was John Krasinski's hit horror/suspense film, A Quiet Place, that was filmed in MSM's home county, Dutchess. This past weekend, I got to watch--twice--my favorite Hudson Valley movie, and my favorite Paul Newman movie, Nobody's Fool. If Ms. Masterson can get a few more films like A Quiet Place and Nobody's Fool made in the Hudson Valley, that would be very good news. Nobody's Fool was also Ms. Jessica Tandy's last film. MSM fans will remember Ms. Tandy from Fried Green Tomatoes. The link to this article is below, along with, once again, the link to Steve's Facebook Group. Get on board today, it's free. You don't have to tell Zuckerberg anything important about yourself if you want to keep it private. Steve Stark also posted this video on his MSM Facebook Group's page. It is a nice look into the past, specifically 1997, the year before this site was started at AOL and then Geocities. It's a great milestone to have recorded. HAPPY MOTHER'S DAY TO MSM AND ALL MOMS AMONG OUR VISITORS! Steve discovered these photos in his searches for new information about what Ms. Masterson has been doing lately in her acting and filmmaking careers. They pictures are also posted on the Facebook Group and there is a link to the group below. STEVE STARK'S FACEBOOK PAGE POSTS NEW STORYHORSE THEATER STORY AND MSM PHOTO. Go to Steve's MSM Facebook group and check it out! Joining Facebook is free! Steve Stark sent word in an email that Ms. Masterson has been busy making a new independent film with the title Skin, about the life of an extremist, racist skinhead activist. Ms Masterson portrays a federal agent, which is probably and FBI agent, although agents of the Bureau of Alcohol, Tobacco, and Firearms have also pursued violent Skinheads in past years. Steve sent a link to an article about Skin on Wikipedia, and that link is below. The film is in post production in Kingston, New York, which means primarily editing. Post production is very likely at MSM's Stockade Works. Good work, Ms. Masterson, bringing filmmaking and training in practical skills to those trying to start careers in the film industry. Steve's Facebook group for MSM has been busy on the run-up to the Easter and Passover holidays. One posting dealt with Ms. Masterson being the producer of the independent film The Rest of Us, which is still in production. I'll put the Internet Movie Database (IMDB) link below. Next, and this is important to all of those who have not yet joined Steve's Facebook group, there is a clip from the 2009 television series Cupid on Steve's MSM Facebook group's page, with Ms. Masterson having a major part in the scene as a woman trying to get a dry martini at the bar. Be sure to check it out, and join Steve's group by joining Facebook, which is free. There is also a link to an article in an upstate New York on-line journal about MSM's role in founding Stockade Works and being a job creator in the local area. I have had some problems with a fourth photo, which is my favorite, but we are working with it and should have it up later today or tomorrow in a separate post. Thanks for your patience! MSM and husband Jeremy Davidson at Oscar night. 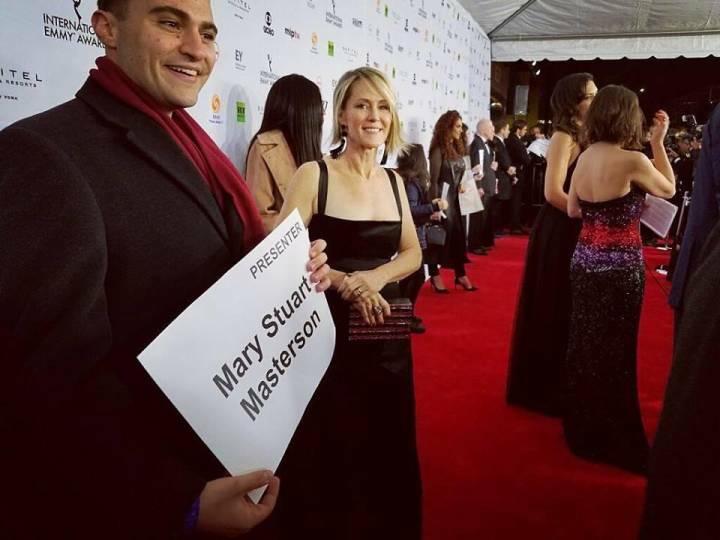 Steve Stark's Mary Stuart Masterson Fan Group on Facebook has entries, including photos and a video, of Ms. Masterson's Academy Award Night party under the auspices of Stockade Works. It looks as if everyone in attendance had a really good time. Stop by Steve's place and take a look. There are also some nice photos of Ms. Masterson, both past and present, in other posts on Steve's Facebook group. The link is below, and you can join for FREE. Steve sent me an email about MSM being cast as the narrator of an elegy to Anne Frank, a Jewish teen who was living in the Netherlands when the country was overrun by Hitler's Wehrmacht. Anne Frank's diary has become a classic story of the suffering and sacrifices endured by individuals during that war. The stage production is titled Hope in the Times of War, and will be shown at the Bardavon 1869 Opera House at 35 Market Street, Poughkeepsie, New York on Saturday, April 21, 2018 with a curtain time of 8:00 PM. I was on one of my occasional visits to my csonline email box as the provider changed the configurations and didn't tell anyone about it. I thought they were hacked for awhile. Anyway, since they changed everything, I cannot send from that address, so I switched back to the ancient AOL address until things could get fixed. They haven't been so far, but I was in there yesterday, and found this email from Claudia Kehl from either very late January or the first of February. I'm sorry I missed it, and Claudia provided a handy link for discovering what is next for former FBI Director Eleanor Hirst now that she is "in stir," as they say around the prison system. Someday, I'll round up the email person from csonline and get my ability to send again. The CarterMatt link to press is below Claudia's email. "STAY TUNED TO BLINDSPOT--SHE'S BAAACK!" I knew that she would probably come back somehow since producer Martin Gero mentioned something in an interview in December.